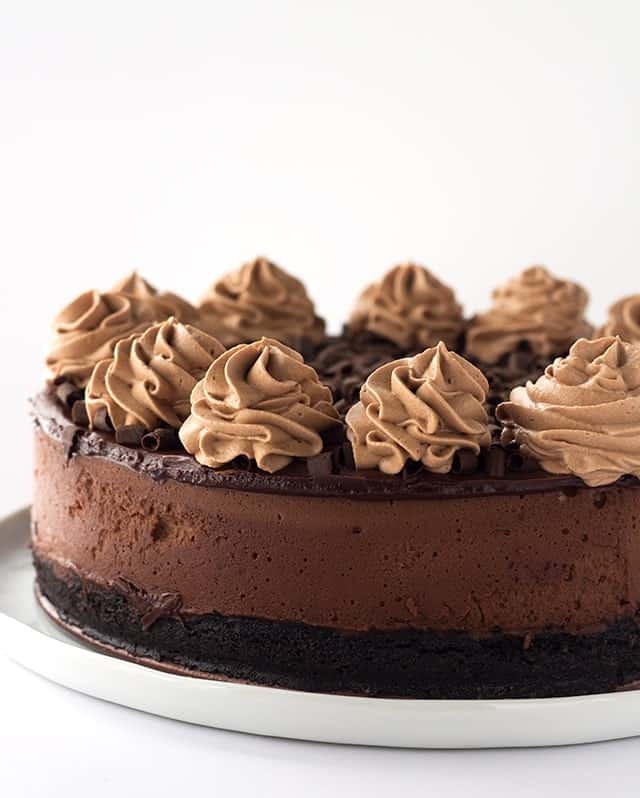 This super decadent triple chocolate cheesecake will surely please any chocolate lover. 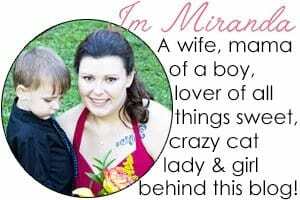 Sure, it’s a little over the top but I have no regrets! 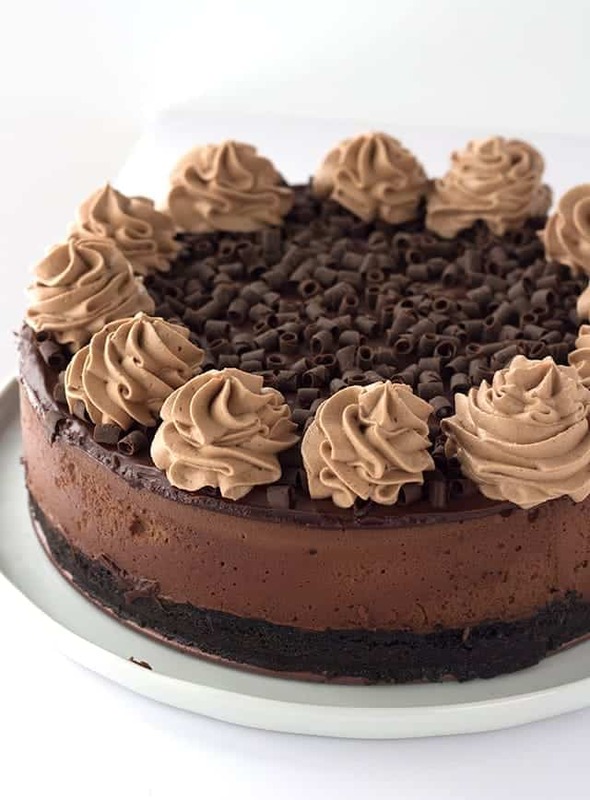 It has a chocolate oreo crust, a rich chocolate cheesecake filling, and a milk chocolate ganache topping. This is totally optional, but you can take it over the top with a chocolate whipped cream! Chocolate week is still happening and I went a little crazy with this triple chocolate cheesecake. 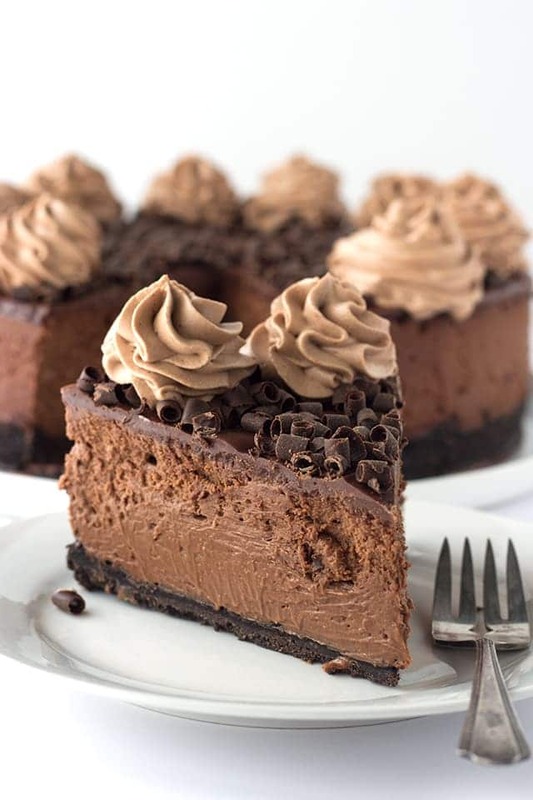 It’s more like a quintuple chocolate cheesecake if you want to count the chocolate whipped cream and chocolate curls, but let’s be honest, no one is going to search for that. Also, I have a giveaway happening at the bottom of this post. You can also find it on my chocolate chocolate chip pudding cookie post. Who doesn’t want to win free stuff? This is a variation of my coffee cheesecake recipe that everyone loves. It’s so incredibly creamy, but I’m sure you can tell that from the picture above. It was nearly the perfect cut until one of those pesky chocolate curls took a chunk out of the side of the slice. What a little bugger, but what can you do? Accept it and move on. I would cry about it but I tend to save all of my tears for those heartfelt movies or when I lose a character I’ve grown attached to in a series. I’m not the only one that does this, right? So, this one time I was full on ugly crying over a series that I was completely invested in. If anyone watched Sons of Anarchy, it was the part where Gemma killed Tara. I’m still pretty bitter with Gemma. AND so help me, if anything happens to Rick or Daryl in the upcoming Walking Dead season, the floodgates will open. 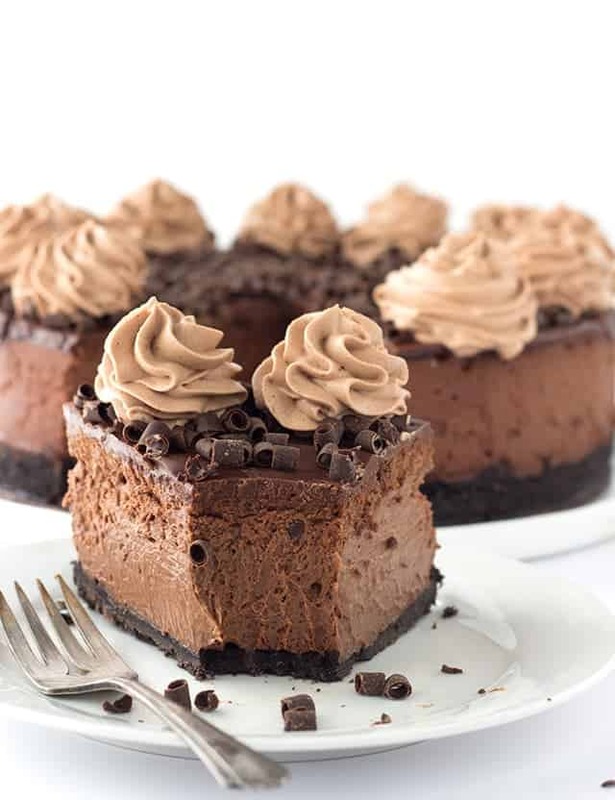 This super decadent triple chocolate cheesecake will surely please any chocolate lover. 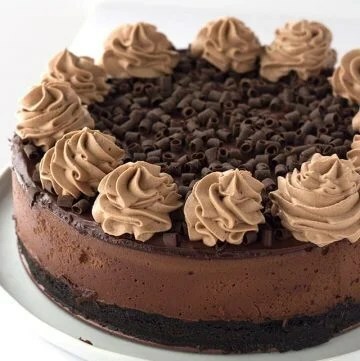 It has a chocolate oreo crust, a rich chocolate cheesecake filling and topped with a milk chocolate ganache, chocolate whipped cream, and curls. Wrap the bottom of the spring form pan with heavy tin foil. I always double wrap it to prevent leaking. Place the cheesecake into a slightly bigger pan and fill with an inch to two inches of hot water. Make sure the tin foil protects the cheesecake so water doesn't leak into it. Place in the oven. Let the cheesecake bake for 1 hour 16 minutes or until done. To make sure the cheesecake is done, give it a wiggle. If it slightly jiggles in JUST the middle like jello, then it's done. If it jiggles all over, it needs to bake longer. Turn off the heat and crack the oven door slightly. Let it cool in the oven. Place the cheesecake in the fridge until it's chilled. I let mine sit overnight. In a separate bowl, add about 1/4 cup of the whipped cream in with the melted, but cooled chocolate. You don't want it piping hot! Fold the whipped cream into the chocolate until combined. this looks absolutely delicious. My kind of cheesecake. I think I just gained 10 pounds drooling over the picture. Need to find a good reason to make this so I don’t eat it all myself. This cheesecake is stunning! I love the added chocolate whipped cream on top. My mouth is watering it looks so good. I sure wish I could reach in the picture and have a sample. This looks over-the-top-amazing. I’m super bummed that we don’t have any birthdays coming up because I need an excuse to make this ASAP! Wow this looks amazing – absolute chocolate heaven! Can I use chocolate wafer cookies for the crust rather than Oreo cookies? I know this is a silly question, but how do you make the chocolate curls? I bought them in chocoley, but I don’t see them on their right now. You can make them with a really sharp vegetable peeler and a chocolate bar. Make sure it’s at room temperature and run it down the side of the candy bar! Made this last night. It is absolutely amazing! Awesome! ? Thanks so much for coming back and letting me know! Just made this last night for my mother in laws birthday. Going to eat it today but looks beautiful. This was so good! But we threw away the half of it on the first tasting. I dished it up for everyone after it had cooled for about 4 hours and it just didn’t taste very good. Almost everyone threw it out. The texture wasn’t quite right, it was too sour, it just wasn’t good. But the next morning I decided to try it one more time and it was delicious! There is some serious overnight magic with this one. You definitely want to make it the day before you are serving it. It was beautiful and delicious. Thank you for the recipe! I’m crossing my fingers…my ganache isn’t setting up. Does it usually take a while? Thank you! It does take some time! Can I refrigerate overnight and then put the ganache on in the morning? Not without making an entirely different recipe. I can put a no bake triple chocolate cheesecake on my list of recipes to make in the future though. Making this for my husband’s birthday Monday! Getting the stuff today ? For the whipping cream what chocolate do you use and how much? Do you use coco powder? This is the dumbest question..but I want to make this cheesecake for a birthday. Do I need to scrap out the center of the Oreo cookie (the white stuff) or do you keep that? I am so excited to try this! Very tempting to make… just took it out of the oven , baked it for 1 hour 10 minutes same temperature, but it had a massive crack on th side and its top seems very dry.. feeling very disappointed..
Oh no. It sounds like it was slightly overbaked.